Arbor House/Jules Schwimmer Residence provides temporary residential and respite services and case management to youth who are at risk, have run away, been displaced from their home, are homeless, or who cannot be home for other reasons. Arbor House is a voluntary safe house that serves youth, ages 12-17. During their stay, youth receive an array of support services including individual and family counseling, case management, referral assistance and life skills training. Youth also participate in recreational activities and group meetings that enhance social skills and positive peer interactions. Youth in residence at Arbor House are maintained in their current school program. Arbor House also offers a case management program for individual and family counseling, and intervention services to youth up to 21 years, who are experiencing conflict within the home, have run away or are thinking of running away, or who have been displaced from their homes. Case management services assist families in achieving goals and maintaining a safe living environment. Case managers also coordinate additional services as needed to ensure the best provision of services for youth and families. Referrals for legal services, educational advocacy, and basic need assistance can also be provided. All services are free and confidential and accessible 24 hours a day. Bilingual staff available. We are proud to partner with the National Runaway Safeline, learn more about their resources by visiting their website: https://www.1800runaway.org. Donkeys Gracie and Reba have been residents of the farm since 1996 and are particularly valuable partners for the children because they offer immediate feedback on behavior. They are patient, shy and headstrong but because donkeys only acknowledge humans who appear calm, this pair helps children learn the skills necessary to approach them gently and quietly. Gracie and Reba also have an extraordinary bond and have difficulty being apart so students must keep this in mind, even for basic tasks such as walking them. 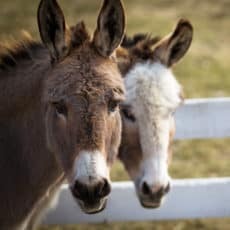 If the donkeys lose sight of each other they will start calling to one another so students work together to make sure the pair can see each other for their entire journey outside.